What is a WordPress RSS aggregator plugin? WordPress plugins are small extensions that you can install on WordPress to add extra functionality to your website. WordPress RSS Aggregator plugins are a class of plugins that we’re focusing on in this article. They fetch RSS feeds and allow the WordPress Administrator to visualize them. Usually they can aggregate multiple feeds into one. They can also let you customize how they are displayed. Why RSS aggregation for WordPress? Breaking news – aggregation here is often used to provide a fuller and more comprehensive coverage of the news. Industry-specific updates – here again, the goal is the same – pooling and presenting the content of an industry in one place. Highlighting multiple websites with the same content. No matter which plug-in we use, and despite the differences between them, the basic concept is one: you enter the feeds, and they sync and visualize their content automatically on the pages of your site. WP RSS Aggregator is on of the most popular WordPress RSS aggregator plugins. Users have the option to add as many feeds as they like. Content visualization is extremely easy, just by copying and placing a special “shortcode” onto the page you want. One important feature is to manage the time intervals of synchronisation of feeds. It can be individual – a feed or group of feeds, at a specific time, at certain minutes, on a daily basis, and so on. Additionally, a plugin can also help find RSS feeds URLs. The plugin also offers a paid plan. The additional options can be quite useful: automatic blogging or converting an article from RSS feed to a blog post on your site. It can rewrite the content of the article to make it unique to your site, including a sample and thumbnail, categorize, filter by keywords and premium widget. RSS Post Importer is a plug-in that besides inserting and synchronizing feeds and displaying them on the pages of the site, transforms their posts into posts on your WordPress website. You can also choose the timing of these posts. This can be done on a daily, weekly or even hourly basis without requiring your supervision. Add your own code to each post. Add a no-follow attribute to the links of each automatically created post. Template for formatting synced content. Set up for authoring the content. This plugin is a bit harder to use then the previous one. Feedzy RSS Feeds is a simple and lightweight plugin that is very user-friendly, fast and intuitive. It uses customizable shortcodes and widgets to aggregate RSS feeds. You can customize the shortcodes and the style of the items. It has 12 different shortcode parameters available. These parameters tweaks things such as limiting the number of items displayed, the maximum characters of titles, and the option to only display an excerpt of the content. 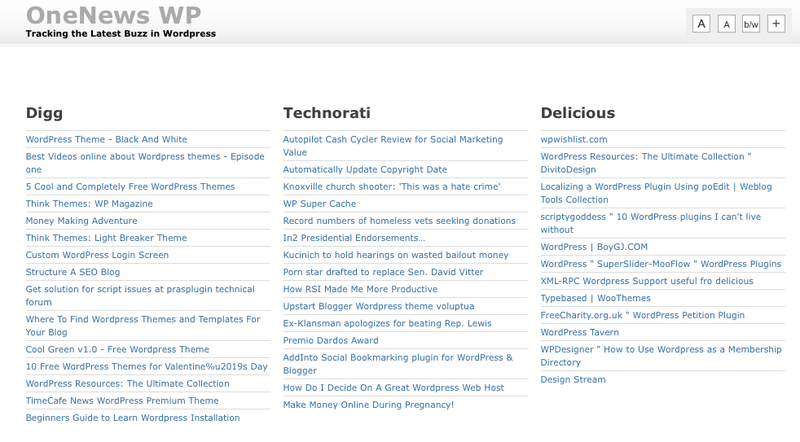 FeedWordpress is also a well known WordPress RSS aggregator plugin. It takes RSS feeds as input and can transform them in a timely manner into posts on your websites. Hopefully you have now seen how aggregating feeds on your website can help you.